In this lesson we’ll take a look at PIM sparse mode which works about opposite of how PIM dense mode works. With PIM dense mode, we flood multicast traffic everywhere and then we prune it. With PIM sparse mode we don’t forward any multicast traffic unless someone requests it. Above we have a video server that is streaming multicast traffic to 239.1.1.1. At the bottom there’s R6 who received an IGMP membership from a directly connected host who would like to receive this multicast traffic. How is R6 supposed to know that the video server at 192.168.1.1 is sending multicast traffic for this group? With PIM dense mode, this was simple. Multicast traffic was flooded everywhere which allowed R6 to learn the source address. Each router that receives multicast traffic from a source will forward it to the RP. Each router that wants to receive multicast traffic will go to the RP. Above you can see that R5 has become the RP in our network. R1 receives multicast traffic from the video server and forwards it to the RP. At the bottom we have R6 that is receiving this multicast traffic from the RP and it is forwarded to the host. We can manually configure the IP address of the RP on each router. There are some protocols that can automatically discover the RP in our network. We’ll talk about this later. When nobody is interested in the multicast traffic then the RP will reject the PIM register message. When there is at least one receiver, the RP accepts the RP register message. R1 will send another PIM register message but this one doesn’t carry the encapsulated multicast packet. It’s a simple request to ask the RP if it is interested now. This packet is called the PIM register null packet. When we still don’t have any receivers, the RP will send another PIM register stop message. When we do have receivers, the RP will not send a PIM register stop message and R1 will start forwarding the multicast traffic. 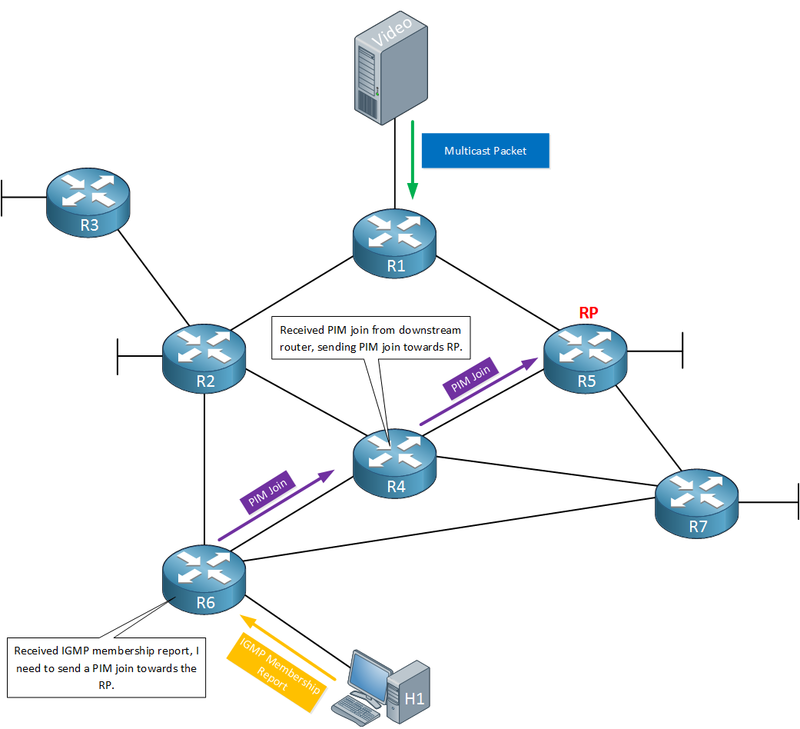 The host that is connected to R6 would like to receive multicast traffic so it sends an IGMP membership report for the multicast group it wants. R6 now has to figure out how to get to the RP and request it to start forwarding the multicast traffic. It will check its unicast routing table for the IP address of the RP and sends a PIM join message on the interface that is used to reach the RP. In this case, that means the PIM join is forwarded towards R4. When R4 receives the PIM join, it has to request the RP to start forwarding multicast traffic so it will also send a PIM join. It will check its unicast routing table, finds the interface that is used to reach the RP and sends a PIM join message towards the RP. The router has received an IGMP membership report from a host on a directly connected interface. The router has received a PIM join from a downstream router. When the RP receives the PIM join, it will start forwarding the multicast traffic. This concept of joining the RP is called the RPT (Root Path Tree) or shared distribution tree. The RP is the root of our tree which decides where to forward multicast traffic to. Each multicast group might have different sources and receivers so we might have different RPTs in our network. Multicast traffic is now flowing from R1 towards the RP, down to R4, R6 and to our receiver (H1). It’s possible however that this is not the most optimal path. The path from R1 > R2 > R6 has one less router than the current path so if all interfaces are equal, this path is probably better. Once we are receiving multicast traffic through the RP, it’s possible to switch to the SPT (Source Path Tree). Since R6 is now receiving multicast traffic through R2 and R1, it doesn’t need it from the RP anymore. It will send PIM prune messages towards the RP, informing any routers in between that they can stop forwarding multicast traffic for this group. You should now have a general idea of how PIM sparse mode works. Let’s configure a small network so you can see this in action! R1, R2, R3 and R4 are our multicast routers that we will configure for PIM sparse mode. S1 will be the source that sends multicast traffic. H3 and H4 are two receivers. Our routers are running OSPF so that we have full connectivity. Want to follow me with this example? Here you will find the startup configuration of each device. Now we can focus on the multicast configuration. It shows the correct holdtime of 105 seconds. Above we can see that all routers have become PIM neighbors. The default version on Cisco IOS is PIM version 2. The expiry time is the holddown timer that is counting down. Each time when the router receives a PIM hello packet, it will reset itself to 00:01:45 (105 seconds). Above we see the output of R1. At this moment we are not transmitting/receiving any multicast traffic but we still see something in the multicast routing tables. There’s an entry for 224.0.1.40. This multicast group address is used for Auto RP discovery, a protocol that dynamically learns RPs on the network. The multicast routing table shows a lot of different flags, we’ll discuss some of them in this lesson. To save some virtual real estate pixel space I won’t show them over and over again when we look at the multicast routing tables. This is the RPT (Root Path Tree) towards the RP. The bottom router receives an IGMP membership so it will send a PIM join. The source IP is indeed learned by looking at the IP header. The PIM tunnel is created every time your router learns a group-to-RP mapping. It applies to static RP, BSR and AutoRP. Great to have you here! We’re happy that you find the forum and Rene’s lessons helpful in your studies! I am confised with Incoming interface and Outgoing interface list before sending traffic. But i am clear about this after sending the traffic. Can you explain it ? In the output of the show ip mroute command, you will see various multicast address groups that exist within the mroute table. For each of these, there is a single incoming interface. Thanks for your in details explanations for each question. Yes it is helpful. Since I became a member, I have developed my skills quite a lot. I just started out studying networking and with help of NetworkLessons.com, I feel much more confident and better. They offer a lot of special content and it is easy to understand. All content is presented step by step and it is presented in a great way if you pursue a Cisco certification. I strongly recommend NetworkLessons.com for all who want to start with networking!